Recent finds in the excavation point to the devastation of this peaceful Iberian settlement by the Roman Army. There are consistent signs of a mass exodus of villagers from La Escuera who had settled here for approx 200 years at the mouth of the Estuary close to Guardamar del Segura. On 9th July 2007, after invited by local English councillors Mark Lewis and Michael Lake, and under the direction of D. Lorenzo Abad Casal, professor of archaeology, Dña. Feliciana Sala Sellés, teacher of archaeology, and D. Jesus Moratalla Jávega, also a professor of archaeology from the University of Alicante, a new dig was started. Due to new discoveries the archaeological team from Alicante university will return to excavate the ancient temple which dates back to the 3rd Century BC. The site is on the high ground close to the Camino del Convenio (bottom) road. For more updated information please check with the Tourist Info office on 966 790 021. Members of the public may be allowed to observe future escavations and and ask questions, and may even be given the opportunity to inspect any newly discovered finds. This site was originally investigated by Swedish archaeologist Solveig Nordström in 1960. It was after Solveig Nordström’s discovery and first ever excavation of the La Escuera site that she wrote a book about this amazing Iberian temple and the large community that once lived here. In 1955 that Solvieg Nordström put her life on the line by lying on the ground in front of bulldozers to prevent an ancient site from being demolished to make way for a new development. 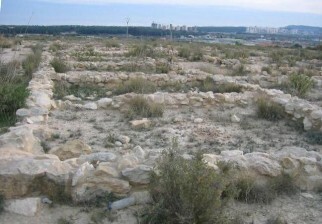 This particular site has now been ratified as the ancient city in the bible known as Lucentum, located just north of Alicante city. The 5000 year old "El Oral" is the other early iberian settlement that is located high up in the area known locally as the Quarry. The Iberians lived in the region from the 6th Century BC right up until the time of the Romans and they were a mix of the indigenous population and Greek and Phoenician explorers and immigrants. They built their cities on hilltops, had kings and Queens and had their own system of money. The Iberian race inhabited the coast from Barcelona right down to Portugal and if you like a drop of wine or cooking with olive oil, you owe it all to them.